Three years ago, a diverse mass mobilization of thousands of activists and advocates from more than 300 labor, environment, civil rights, and faith organizations, descended on Capitol Hill for Democracy Awakening in a brilliant display of solidarity and direct action to demand an equal voice in our democracy and government that is accountable to people. In the months after Democracy Awakening, the reform movement grew in strength in states all across the country. Fights in the states, led by everyday Americans standing together to demand democracy, culminated in the passage of over 20 pro-democracy referendums in the 2018 midterms. It was the reform fights on the ground that created the demand for national action on reform, and in 2019 we saw the historic passage of H.R. 1—the For the People Act—through the House of Representatives as a direct result. Now, three years later, we can look back and recognize that today’s gains began as yesterday’s demands. Help us celebrate this anniversary—and all the progress we have made—by reaching out to your supporters through social media and email and reminding people about this critical event. Click here to see our social media toolkit. 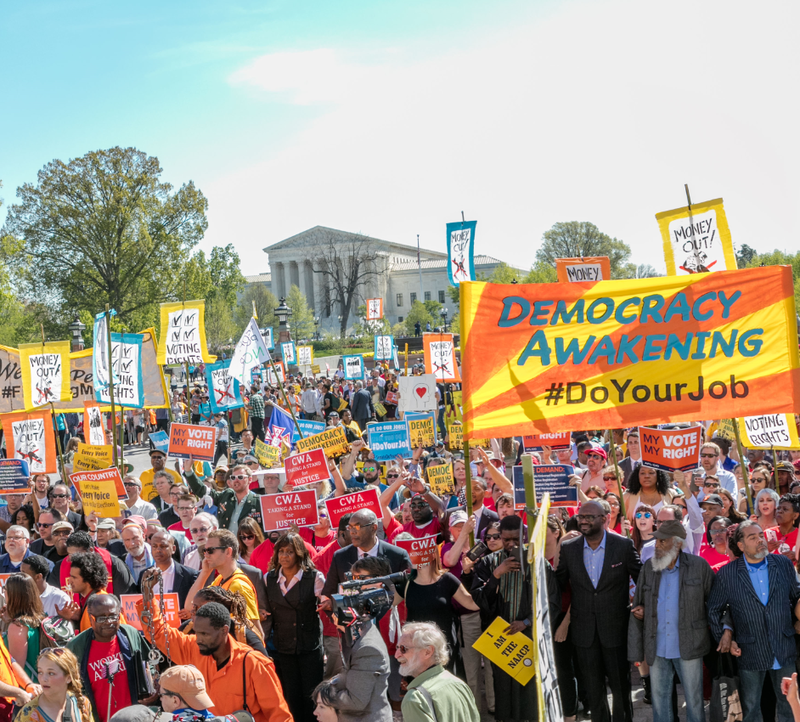 We are asking partners to use the hashtag #DemocracyAwakening during the three year anniversary of the event, Tuesday, April 16 – Thursday, April 18, and both celebrate the event, as well as draw the connection between that moment and progress we have made. 2016: Six months after the Democracy Awakening, the Florida Rights Restoration Coalition drafted Amendment 4 and gathered enough signatures to submit the amendment to review by the Florida Supreme Court. 2017: the Howard County Citizens Election Fund campaign, joined by the DI coalition and partners and allies on the ground, culminated in a historic victory on July 3, 2017. The historic Voters Not Politicians Campaign in MI began touring the state and gathering signatures, which were ultimately delivered to the Michigan Secretary of State by December 2017. 2018: Passage of six Ballot Measures the DI worked on, included within the 22 pro-democracy referenda in total passed in the November 2018 midterm elections. 2019: The historic passage of the new floor of democracy reform, H.R 1, alongside passage and funding of Let NY Vote and the suite of voting expansion legislation out of New Mexico. WHAT WAS THE DEMOCRACY AWAKENING? First and foremost, it was tipping point in the democracy reform movement. From April 16 – 18, 2016, people from all over the country mobilized to fight the power of money in politics on our political system, to protect and advance voting rights, and demand a hearing and vote on the Supreme Court vacancy in the Senate. The weekend-long event consisted of panels and teach-ins, a march on the Capitol, and a non-violent direct action that saw 306 arrests of democracy leaders and activists. The Democracy Awakening made one thing very clear: that people across the country are standing up and demanding democracy. It showed that people from all walks of life can agree on one thing: a functioning America requires representative, equitable, and responsive democracy. Most importantly, the Democracy Awakening showed that the movement for a stronger democracy was just beginning. You can read more in our archives by checking out The DI Report: Democracy Awakening from 2016, and over at the Democracy Awakening website. The Committee on House Administration Subcommittee on Election is organizing a number of field hearings to focus on voting rights and election administration. This is a prime opportunity for impacted individuals, voters, and state advocates to put a face to the election issues that communities have faced in recent elections. We need to show congress that Americans care about voting issues by getting local advocates to turnout for these hearings, and getting all our organizations to join in lifting up this message! The Leadership Conference has developed invitation language and sharable resources for use in generating turnout and social media engagement. Click here for turnout resources. (Note: according to LC, social media content will be added soon!) Also attached are some topline framework messaging on VRAA. For more information and for ways to get involved, reach out to the Leadership Conference's Regional Field Manager Jordyn Bussey at jbussey@civilrights.org. Last week, Georgia Governor Brian Kemp quietly signed 21 bills passed by the Republican led House and Senate. Included in these bills was HB 316, which made Georgia the first and only State to rely entirely on electronic voting ballot machines, without the use of hand-marked paper ballots. 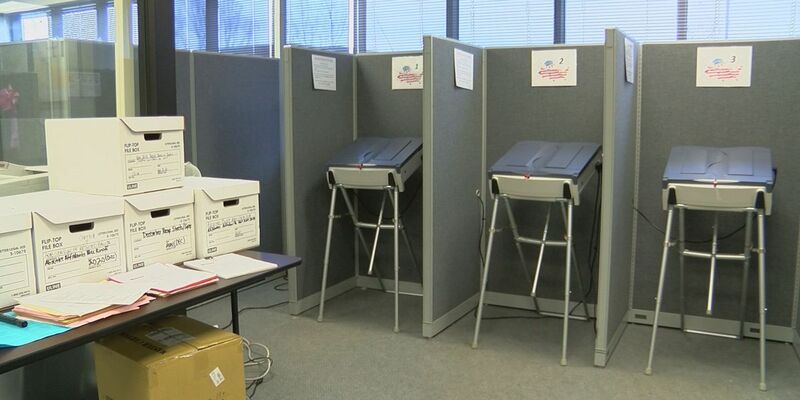 The new system would allow voters to mark their selections on a machine and receive a printout that serves as their ballot. Kemp and other Republicans supported the new system as "a more accurate" way to count votes, saying they’re easy to use and provide a paper record to verify vote counts. However, cybersecurity experts and election integrity advocates have insisted for years that the safest, most secure way to count ballots is by using a hand-marked paper ballot system. Republicans in Georgia have once again looked the other way when it comes to election safety and security. In a letter addressed to the Georgia Secretary of State, 24 of the foremost cyber- and election-security experts detailed concerns that this new system will be prone to several vulnerabilities, including hacking and vote manipulation. This latest bill must be viewed within the context of Georgia's long history of voter disenfranchisement and voter suppression—including under former Secretary of State, Brian Kemp, who now serves as Governor and was cast as the "architect of voter suppression" in the state. These vulnerabilities provide further opportunities to manipulate vote tallies for political gain. Why else would they be so eager to implement a system compromised with so much uncertainty? They've proven themselves to be willing to use these tactics in the past, and they've chosen to continue to use them right before our eyes. Alliance for Justice released a new report April 3, 2019 on the Trump Administration’s assault on the Federal Judiciary. AFJ’s report provides an incredibly useful entry point to the discussion around courts and why they matter. To read the full report, click here. They’ve also provided a social media toolkit to help partners share the report. This week, the Lawyers’ Committee for Civil Rights Under Law and state partners—the Tennessee State Conference of the NAACP, Democracy Nashville-Democratic Community, League of Women Voters of Tennessee, Urban League of Middle Tennessee, The Equity Alliance, and Tennessee Black Voter Project—issued a letter urging the legislature to reject a proposed bill that would have a chilling effect on voter registration efforts and voting rights across the state. The bill seeks to impose a range of restrictions on third-party voter registration groups. The bill, if passed, would require organizations that register voters to comply with preregistration requirements or face draconian criminal and civil penalties, including fees in the tens of thousands of dollars. Read the press release and the full letter here. On Thursday, May 2, the Arab American Institute Foundation will celebrate the 21st anniversary of the Kahlil Gibran Spirit of Humanity Awards Gala at the Omni Shoreham Hotel in Washington, DC. Since 1998, the Gibran Awards has honored those whose work and vision embrace and embody the ideals of the great poet who hails from Lebanon—compassion, justice, and endurance. This year continues in that tradition as we celebrate five extraordinary awardees—RAICES; former Berkeley Mayor Gus Newport; the late Miriam Zayed; Tunisia superstar Emel Mathlouthi; and the BBC’s Lyse Doucet. You can learn more about this year’s awardees here. Please RSVP to Ana Horn at ahorn@aaiusa.org or 202-429-9210 by Friday, April 5. Gala attire is black tie, and the reception begins at 5:30 p.m., with dinner and the program following promptly at 6:30 p.m. The Democracy Initiative is a unique, broad and diverse coalition of 70 organizations committed to strengthening U.S. democracy by growing the grassroots activist base. We are seeking a high-energy, creative, experienced leader committed to bottom-up organizing to coordinate our democracy training, leadership development, and movement-building activities. Click here to see the full posting. The Democracy Initiative, a dynamic network of 70 organizations, representing 45 million members, is seeking a talented grassroots mobilizing intern to join our team for the summer. Working under the supervision of the campaign team, the Grassroots mobilizing Intern will assist with message development, organizing campaigns, training, and mobilizing democracy issues to our partners. This is a paid internship. DI partners are encouraged to recommend qualified, diverse candidates!